You can send details of your work, if you’d like to be considered for a booking on the festival stages Alan curates or at events he organises. 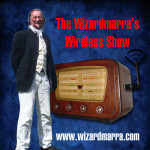 Also If you like The Wizardmarra’s Wireless Show, then why not submit your music to be featured in a future podcast? They’re available for download on iTunes, Zune, Miro, Stitcher, Blubrry and more; so you’ll get loads of exposure, which is especially good for up and coming artists. Simply fill in the email form below, giving details of you, your band and where your music can be found online. Podcasts are distributed free for domestic use. Given the nature of sharing content on the internet, it can’t be guaranteed that your work won’t be copied, so if you’re just wanting to get more fans, then this is a great outlet for your talent! Alan will email you directly to let you know if/when your music will be featured in a podcast episide or to make a booking; including the code for you to paste into your website or blog, to tell your fans about it using this exclusive badge. Email now to submit your music for consideration! By ticking this box, I confirm that I am the copyright owner or authorised agent and I permit Alan Whittaker to publish and reproduce the linked audio files, for use in podcasts and related media; which will be made available to the general public.